You have your marching bands, the local sports clubs, sponsorship and the odd float, but how do you really turn your event into a WOW-Factor? Robot Networks has you covered! 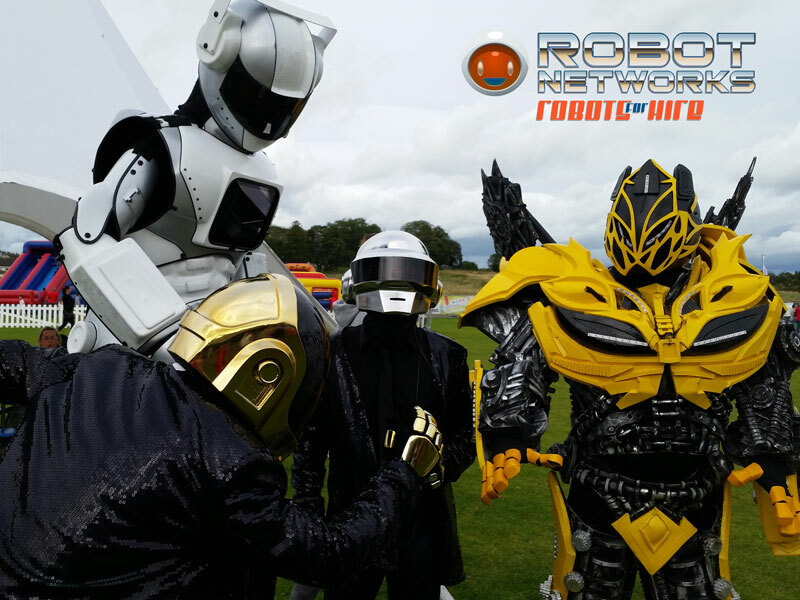 We provide THE most exciting NEW Entertainment for hire in Ireland to date, providing a number of Robot Entertainment Acts to make your day of fun a memorable extravaganza and your guests in stunned amazement. Our main and most sought after performer, Robot-TED, is an 8ft tall, fully functioning, all interactive, walking and talking humanoid with a full LED display, who will have the entire crowd, from start to finish, in complete awe! We also offer Profile Entertainers such as our Hollywood movie star, Transformer Robot ‘Bumblebee’ to keep all the kids excited and Transformer fans entertained. And if that wasn’t enough we also represent a team of Star Troopers who hail from the iconic Star Wars, perfect for all who’d like their event to be out of this world. Among a whole list of Robot Acts, we would like to introduce to you our incredible and innovative Robot Djs for hire nationwide, who will undoubtedly keep your guests on their toes. Included in our list of celebrity acts, are one of Ireland’s top tribute bands the effervescent ‘Daft Punk Tribute’, a fully authentic daft punk feel with brand new LED display helmets. Just like the real deal! Book a ‘Silent Headphone Disco’ to keep the noise at bay, while entertaining your guests with their personal favourites. Chat undisturbed to your friends and have a laugh watching the party dance in “silence”. We promise, you have never seen anything like it! For more information on any of the robots or any inquiries on booking the robots, call +353 86 205 4795 or visit our Contact Page for more information. Book now; our robots are an extremely busy bionic bunch!